But Anca Stefan, a high school English teacher in a Durham public school, says she’ll fork over the $50 next month to take a “personal day” and join hundreds of her local colleagues to promote school funding increases at the General Assembly. 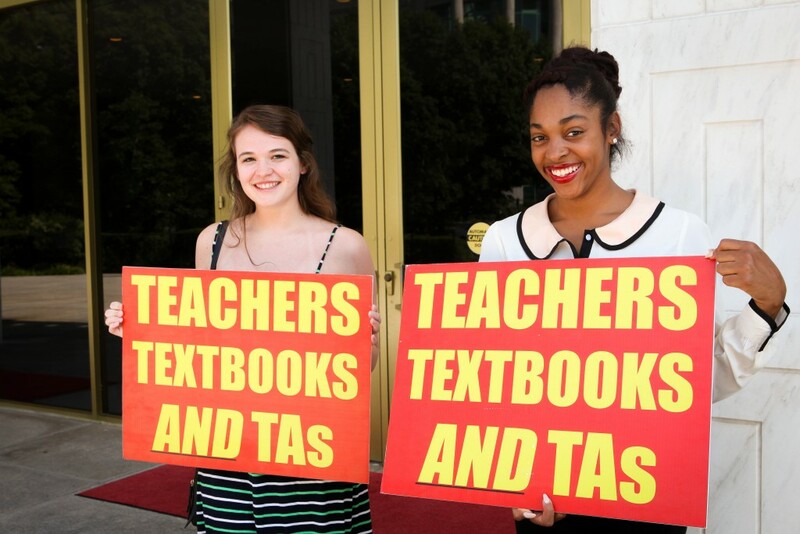 At a so-called “advocacy day” timed to correspond with state lawmakers’ May 16 return to Raleigh, organizers with the N.C. Association of Educators, a group that lobbies for thousands of teachers statewide, say they’re hoping to draw as many educators and parents as possible. Their focus—veteran teacher pay, retirement benefits, textbook funding, school support personnel and the rise of private school vouchers—shouldn’t mark a large departure from the teacher protests of the past. The difference is scale. Indeed, the May convergence in Raleigh may be one of the largest educator rallies in North Carolina in some years, some say, and it comes in a year when teachers in many GOP-controlled states have been organizing for, among other things, better pay, better pensions and an overall increase in public school funding. Stefan, like an estimated 400 or so of her Durham colleagues, has already put in for her personal day, a leave designation that, in North Carolina, requires public school teachers pay $50 from their paychecks. The price is worth it, Stefan says. She calls it her “duty” to advocate for her students to state lawmakers. And while most education leaders say North Carolina isn’t likely to see the kind of prolonged protests or picketing that forced school districts in Kentucky and Oklahoma to temporarily shut down schools this year, teaching leaders hope the gathering will be enough to galvanize state lawmakers, many of them Republicans who’ve clashed numerous times with educators over pay and K-12 funding in recent years. The NCAE tends to back Democrats, but its president, Greensboro teacher Mark Jewell, emphasized this week that the May rally will be nonpartisan in nature. And he says the protests have been a long time in coming, with states seeing massive reductions in public school funding alongside the growth of controversial private school voucher programs. In North Carolina, the state was budgeted to spend $44.5 million on vouchers in 2017, and that figure is slated to grow by another $100 million over the next decade. 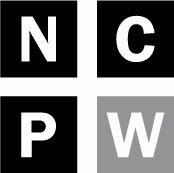 Meanwhile, a November report from the nonpartisan Center on Budget and Policy Priorities found that North Carolina was one of 29 states in which total state funding per student remained below pre-recession levels when adjusted for inflation. 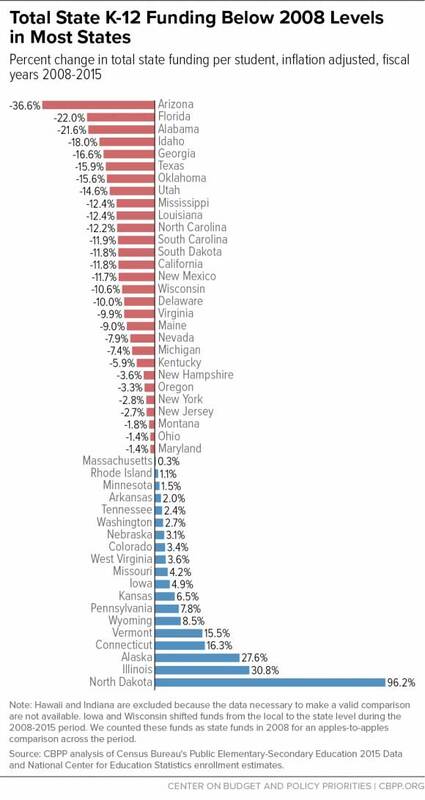 In North Carolina, that report found, total K-12 spending was down by more than 12 percent. Coupled with a recent report that ranked North Carolina 43rd in per-pupil spending nationally, overall school funding figures to be a major part of the May rally. “It’s part of a larger plan, particularly in states that are dominated by the GOP right now, of dismantling public education,” says Jewell. Republican Rep. Craig Horn, an influential budget writer from Union County, says he’s “glad” educators and parents are descending on Raleigh next month, even if he thinks some of the criticism of the legislature has been unfair. “I’m looking forward to delving deeply into what they’re supporting and why they’re supporting it,” he said. But Horn says that the state’s low per-pupil spending ranking should be considered in the context of rising student enrollment over the last decade. During the time period studied in last November’s report on total K-12 funding, enrollment in North Carolina’s traditional public schools and charters rose by about four percent, surpassing 1.5 million. Yet, even as state lawmakers approved modest raises for some teachers in recent years, legislators faced withering criticism from education advocacy organizations who pointed out the state’s most experienced teachers were left out. Meanwhile, some teachers actually saw a decrease in take-home pay when rising health insurance costs were factored into the equation. Jewell says lawmakers approved raises “haphazardly and not fairly.” Additionally, a GOP-led push to scrap retirement pension plans for new teachers has educators fired up, as well as longstanding demands for boosts to textbook funding. And lingering controversy over a legislative mandate to cut class sizes left educators and Republican lawmakers squaring off again in 2017 and 2018. Legislators are also likely to face pressure this year to approve a $1.9 billion statewide bond referendum for school construction and maintenance, an issue Horn called “incredibly important” Thursday. If approved, the bond vote could partly address more than $8 billion in reported needs by local school systems. “We are going to be watching closely,” adds Jewell. Jenn Smith, a Winston-Salem parent of two, plans to join teachers in May too. This week, she told Policy Watch that these kinds of protests are a “last resort” for frustrated teachers. Sen. Erica Smith, a Democrat who sits on the Senate education committee, applauded the teachers who plan to gather in Raleigh next month. Smith, a former K-12 teacher who now works as a secondary math instructional specialist for public schools, said the state needs to do more to assure a “comfortable” teacher salary, as well as ample funding to close yawning student achievement gaps. “There is an imbalance of honor in this country, in terms of respect for the teaching profession,” said Sen. Smith. It’s unclear how many will attend the May advocacy day, which will include a march from the NCAE’s Raleigh office to the legislature, as well as an afternoon rally near the Bicentennial Mall. It’s also uncertain whether any schools will need to close as teachers flock to Raleigh, although Mike Lee, school board chair for Durham Public Schools, acknowledged it’s a possibility with many Durham teachers filing for their personal day next month. Lee said such decisions will be made at an individual school-level. “If we don’t have the personnel to provide the safe environment for education that we need for our students and instruction, we would have to (close),” he said. But Lee added that no teachers should be derided for their plans to rally in May, similar to the way that Oklahoma and Kentucky teachers faced criticisms from some conservative leaders, including U.S. Secretary of Education Betsy DeVos. Horn said this week that he would not criticize teachers for their advocacy. “All of us, both sides of each issue, need to learn to talk to each other and not at each other,” he said. Indeed, Stefan says next month’s advocacy day isn’t “some impulsive, irresponsible, selfish act.” She says the message will be one state lawmakers need to hear.